Location: North 59:31.176, East 008:35.698 (GPS on the summit). 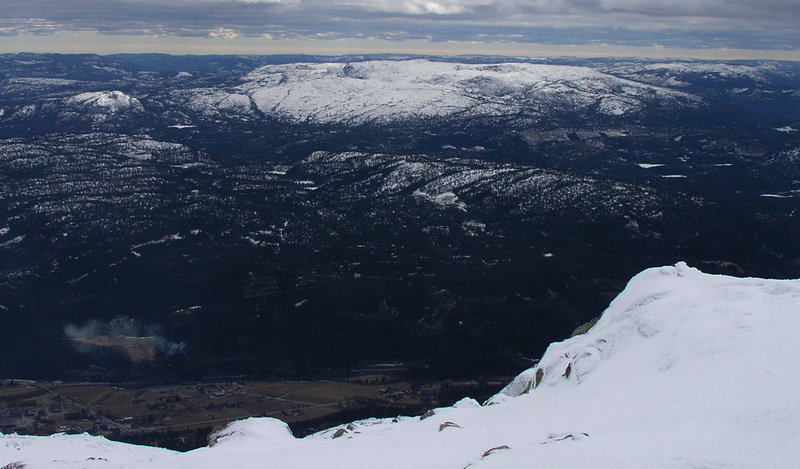 How to get there: This mountain is located near the village Seljord in Telemark. The main hwy. E-134 connecting Oslo and Haugesund gives easy access both from the east and from the west. In Seljord, turn off E-134 where a large Shell gas station is located. Drive into Seljord, the post office will be on your right, then turn left on the main street and proceed about 500 meter to the first significant road going right. This road is named Sundsbarmvegen, turn onto this road and measure from here. After approximately 0.2 km, go right, then continue straight after about 0.6km. At 0.8 km, turn left, then shortly thereafter go straight. After about 1.4 km, keep right and stay on the road that is paved. The road now heads up the valley and turns int a dirt road. At km 4.6, you cross a bridge, then stay left as the road curves around some buildings. The road now climbs a bit and at km 5.6 you will find a large parking area on your right. This is the trailhead, park your car. The road continues uphill, you are now in Kivledalen, however, there are no signs saying Kivledalen along this route. 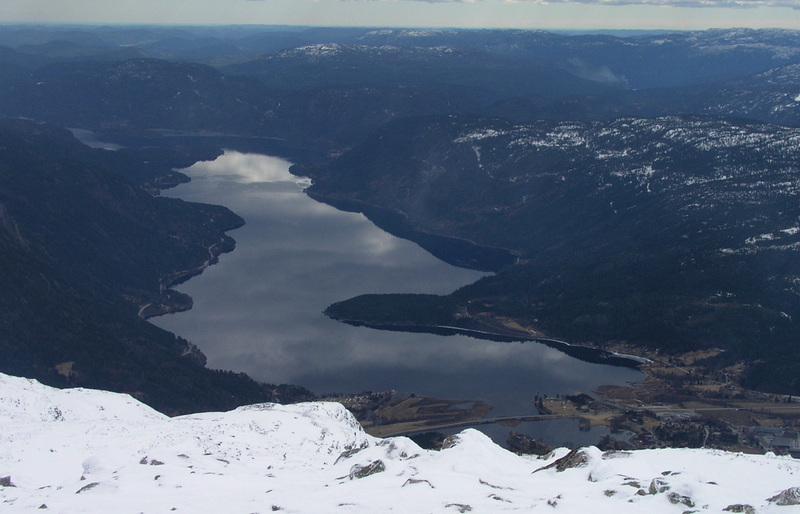 The precise location is north 59:30.470, east 008:34.240, with an elevation of 528 meter. It is possible that this road is closed (by snow) further down in winter. If this is the case, find parking earlier and follow the road as described above to the trailhead as given here. Route description: This mountain is called Skorve or Skorvefjellet. 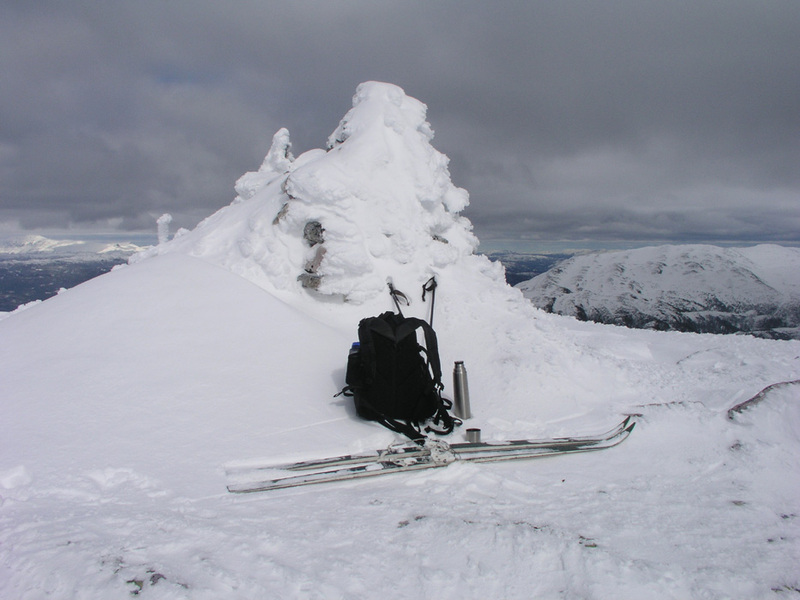 It has two main summits, Gøysen 1370m, in the south and Nordnibba 1365m in the north. This route will provide a good way to visit both summits. From the trailhead, continue uphill along the road. This road climbs with several curves, then levels out just below 600 meter of elevation. The map indicates that a trail forks right in this area. If this trail can be located, then follow it upwards. In winter, it may be better to continue along the road as it descends a little, a forest road forks right near the bottom of this gentle hill. 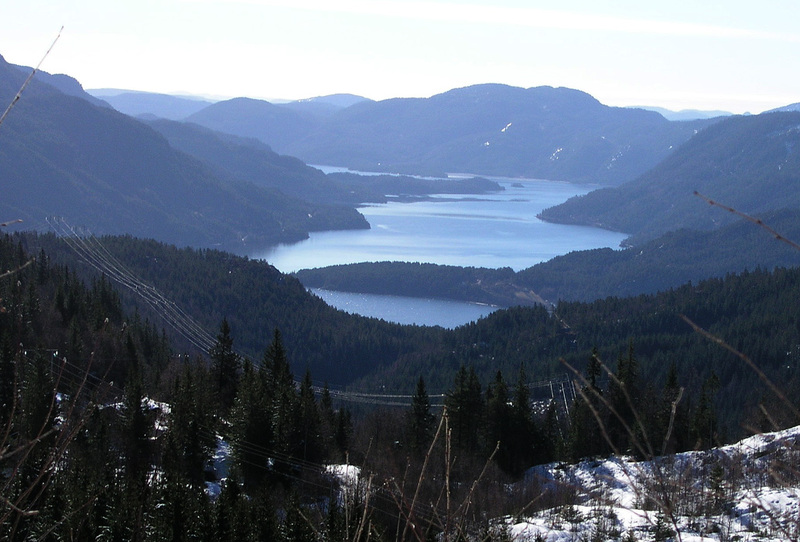 Take the forest road and follow it as it climbs steeply, while gradually changing direction back towards the creek that comes steeply down from the lake Tvitjørnan (1263m) above. 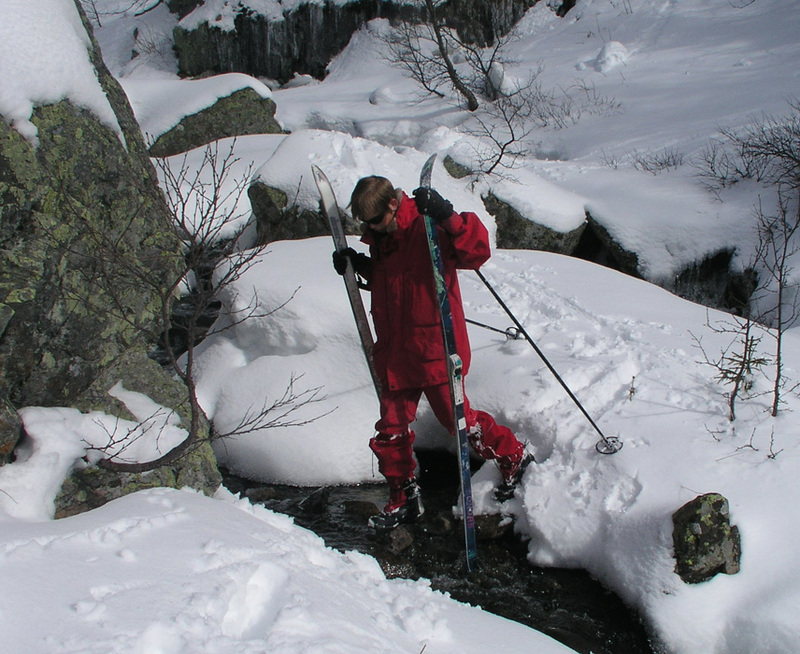 At about 700 meter of elevation, the route continues on an ascending traverse to the creek Finndalsåi, one should cross this creek a bit higher than 800 meter. If the summer trail can be followed, this is likely a very good idea, however we were unable to see any trail in early April. The terrain is partly steep, and it seems like the best approach may be to make this traverse about as high as possible, just below the steeper cliffs higher up. 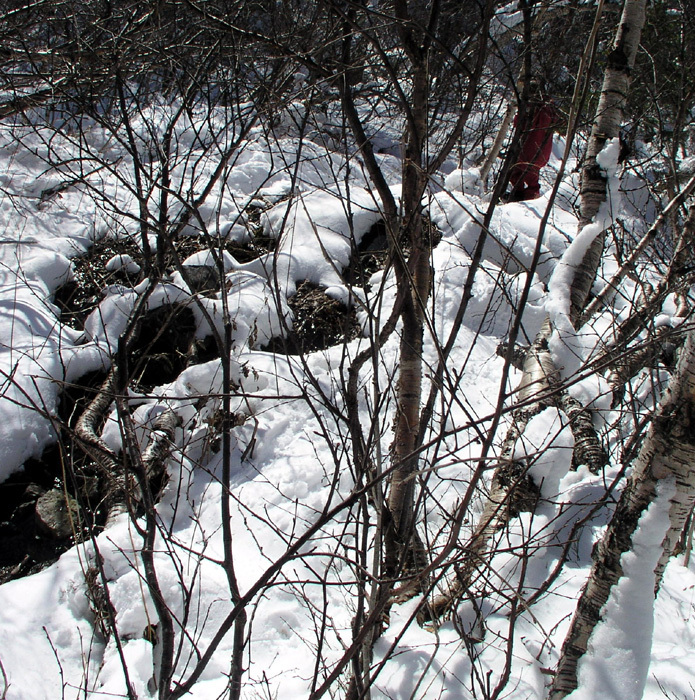 We completed the traverse on skis across very complicated terrain, mainly blocked by birch trees that, more horizontal than vertical, were too low to crawl under and too high to cross over. In fact, unless the snow is absolutely bottomless, it is faster to cover this distance on foot than on skis. 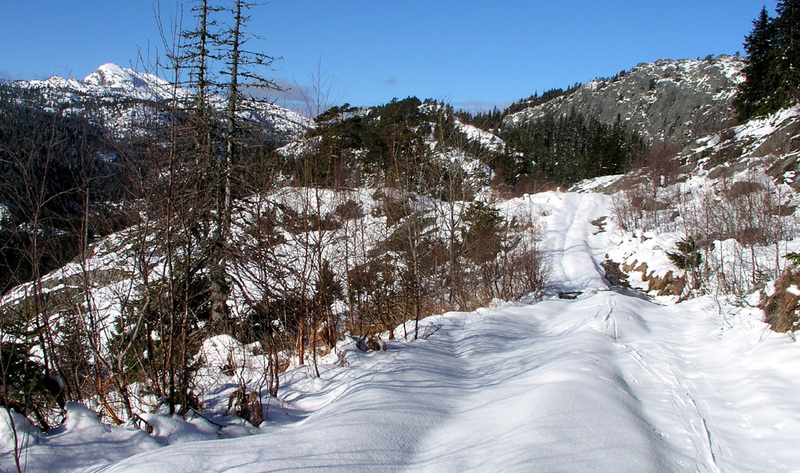 This short, but (at least in winter) very cumbersome traverse ends as you reach the creek that comes down Finndalen. It runs in a pretty distinct mini-canyon. There is however, good access down a reasonable slope about as far uphill as one can go. On the opposite side, the first few meter are steep, move left to find a bit easier slope. As soon as the initial, but very short steep slope is behind you, the trail climbs more gently. Here, there is a pretty clear trail marked with red paint. The trail runs up the slope, mainly on the left (facing out) side. Continue almost to the highest point of this local hill, there is a hut and an old farm building located there. From this cabin, cross over to the uphill slope and traverse right, only slightly uphill. 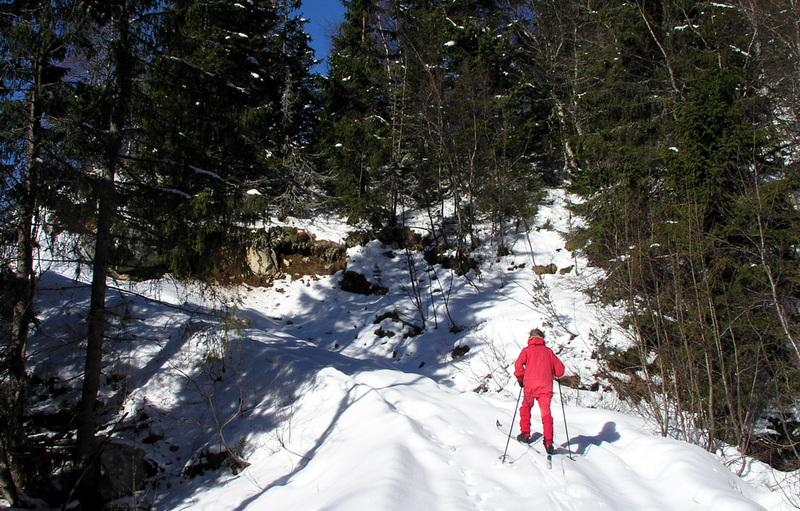 As soon as you reach the ridgeline, the slope becomes much more gentle and one may proceed into Finndalen eventually crossing the creek and gradually climb the gentle slope on the opposite side. As the trail continues, you will gain elevation and gradually curve right until you reach a more level area. Straight in front you will observe a small valley (or large gully?) that comes down from higher ground. The route continues up this natural way, a bit steeper in the beginning, then more gentle until it tops out at about 1300 meter just below the mountain named Nordnibba. This location is north 59:31.471, east 008:33.414. From here, the terrain is quite easy to the summit further south. Comments: I started this hike with my son Pål Jørgen, and he bravely struggled his way through all the difficulties in the first part of the route. However, he had a pretty bad cold and at elevation 927m, we decided that he should turn around and wait in the car. We had started at 0900, and it had taken us 3 hours to get this far. I continued up and reached the summit at 1330. On the way back, I also traversed the summit called Nordnibba. 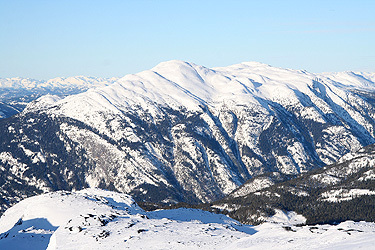 This mountain is 1365 meter, with a saddle to Gøysen between contours 1270 and 1275, so interpolated at 1273 meter, Nordnibba has a primary factor of 92 meter. Thus, it barely misses my 100 meter criteria for being an independent peak. The Nordnibba summit is located at north 59:31.619, east 008:33.632, elevation 1365 meter. There are actually two small summits quite close, it appears that the one given here is just a tiny bit higher. I continued the descent from Nordnibba and reached the car at 1545. One should note that two airplanes crashed at this mountain during the second world war. One American airplane dropping supplies to the Norwegian resistance forces, and one German passenger plane, both accidents due to bad weather and the airplanes hitting the mountain. Skorvefjellet (Gøysen), as seen from the route of ascent. The trail starts out along a forest road. Lake Seljordsvatn (164m), comes into view. Forest road, the route descends a little, then forks right and climbs steeply. Very complex skiing. After leaving the forest road, on the traverse to the creek. PJ on his way down to the creek. 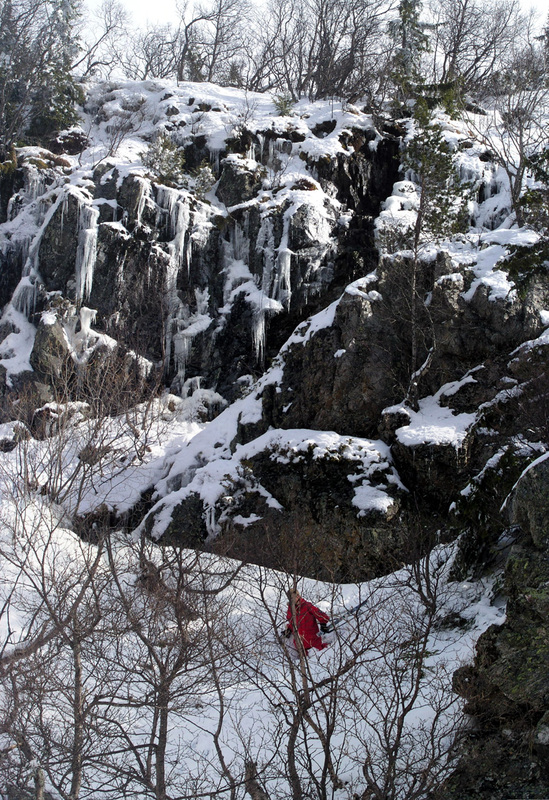 The creek runs in a canyon, very steep on both sides, more climbing than skiing here. Lake Seljordsvatn (164m), more than 1250 meter down. Gaustatoppen, the summit hits the clouds. Mælefjell (left) and Lifjell as seen from Gøysen. Roan (1191m), as seen from Gøysen. Panorama when ascending Gøysen, the view is west to north. Panorama from the summit of Gøysen, the view is north to east.